In view of growing demand on human and material resources on the Nigerian Army(NA) to meet security challenges has embarked, NA has commenced restructuring and reequipping of its medical corps facilities to guarantee availability of world-class care for the safety of the lives of troops and effectively handle emergencies. He disclosed the army has already started the refurbishing of facilities, especially in the tertiary hospitals. The Chief of Army Staff also announced that the hospitals can now boast of diagnostic equipment like a mammogram, CT scan, MRI and others as well as ultramodern theatre facilities for the management of surgical cases. Represented by Maj.-Gen. Enebong Udoh, the General Officer Commanding (GOC) 81 Division of the Nigerian Army, he said the move was also to reduce medical tourism. “NA is faced with security challenges that have put a high demand on human and material resources. To surmount these challenges requires that medical professionals should be well-trained and competent. All efforts, therefore, be geared at reducing the effects of sicknesses and injuries in the battlefield through an efficient causality management system. He said in view of the huge investment being made to upgrade the facilities, medical personnel are expected to be capable of handling newer sophisticated equipment and maintain them. Giving his welcome address, Maj. Gen. Ikechukwu Okeke, the Corps Commander Medical, NAMC, who bemoaned the shortage of medical personnel disclosed that all categories of staff of various specialities have been called upon to perform trauma care or nursing roles due to the exigencies of duties. Noting that every personnel privileged to wear the maroon beret must have basic combat casualty care training; he said they have identified some gaps in the knowledge and training of NAMC personnel which has been seen not only in combat causality care, but also the quality of care in NA medical facilities. Okeke said that following insufficient number of doctors and nurses, there is need for more personnel to be trained to provide care especially in the pre-hospital setting in the field. “As part of my effort to enhance the quality of care in NAMC facilities, a new directorate has been established at the headquarters in line with NA Order of battle, ORBAT 2016. Maj. Gen OA Ogunbiyi, in his lecture, “Enhancing Quality Healthcare in Nigerian Army medical Corps Facilities,” identified poor infrastructure, skilled manpower, funding, the attitude of healthcare providers and training as challenges facing NAMC. Ogunbiyi recommended that the Army Head Quarters, AHQ, should sustain the annual recruitment of skilled manpower via a special commissioning scheme. 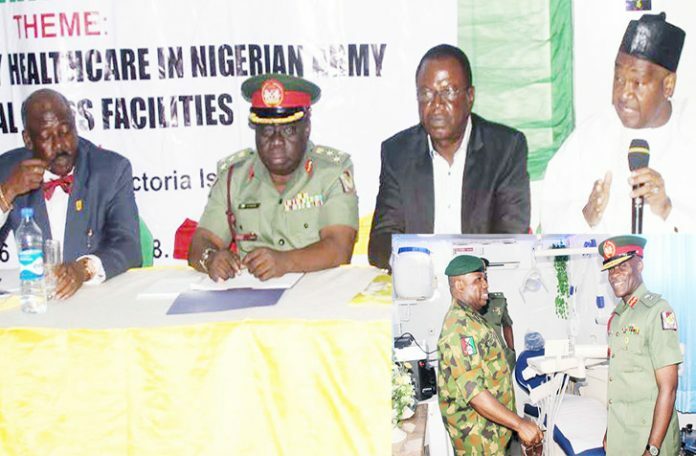 While insisting that provision of qualitative and accessible healthcare services to members of the armed forces was of paramount importance to the Federal government, he called for attitudinal among NAMC healthcare providers and across all ranks.